The subtitle of this book is: Travels on Three Continents in the Footsteps of a Hero. 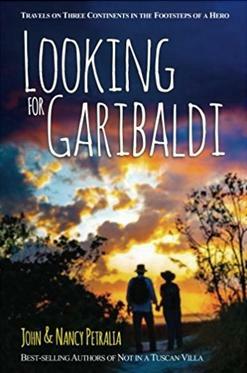 Looking for Garibaldi is this US-American writing couple's second travel memoir. 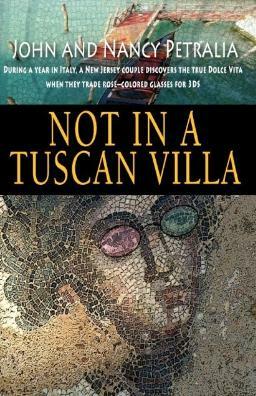 The first, Not in a Tuscan Villa, provides lots of details about their one year living in Italy. At times I felt inundated by details while reading that book. That is not the case with Looking for Garibaldi. I feel they have achieved the right balance with this one, between a vicarious travel book and a spot of history for casual readers. 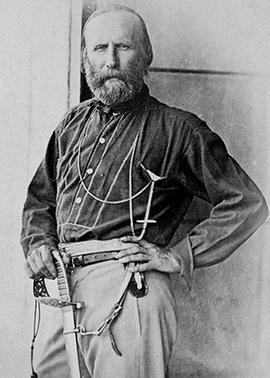 Giuseppe Garibaldi was a complex man with a complex life. I've always thought that the many history books dedicated to his story appear to struggle to present a coherent narrative. So I approve of the Petralias' choice to not write a history book, but instead a travel memoir in which they describe some of their experiences while crisscrossing the Atlantic, just as Garibaldi did, while visiting points of interest from Garibaldi's story. If readers are later drawn to learn more about the Italian freedom-fighter (from Spanish colonialism) and Italian unification military leader (of the famous Red Shirts) I think that's wonderful. When traveling in Italy and many parts of Latin America, one can't help but encounter squares, streets and parks named for Garibaldi. Gaining greater understanding of why that is, can only help one appreciate Italy and Italians better. Italy is a relatively young country, formed of very different regions with different histories, languages and values. The Petralias describe these contrasts well in their earlier book, and touch on them again in this memoir as they move from the north to the center, then to the south of Italy. Once again, the personal connections they make as they travel are the most memorable parts for me, and the connections to John Petralia's Italian-immigrant family that come up during their travels are very moving. In this book we encounter the loving couple as they deal with the difficulties of aging combined with the difficulties of travel, which many readers will find understandable. We also get some interesting recollections from John and Nancy's childhoods in the States. Fans of the couple will get to know them better. Be warned, some of John's chapters (they alternate chapters) contain vulgarities, politics, controversial economic theories, some coarseness, and punctuation that purists may find distracting. I enjoyed my vicarious travel with the couple. For those of us who can't, for whatever reason, hop on a plane to Brazil, Argentina, Uruguay, France, Italy, or the east coast of the U.S., this travel memoir could help fill the void for excitement, risk, human contact and sensory stimulation. Their writing brings people and places alive. I wish them success and good health. Can following the footsteps of one of history’s most colorful figures lead to an unusual travel adventure? Absolutely. 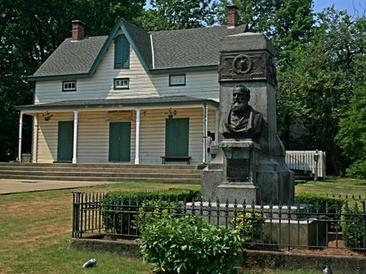 Giuseppe Garibaldi led freedom fighters on two continents, unified Italy, and almost headed America’s Union Army. His statues stand in cities around the world. So what do people today think of his accomplishments? In Looking for Garibaldi, John and Nancy Petralia discover that answer and more as they explore, often in hilarious ways, the places Garibaldi lived and fought, and how their lives parallel his. In stories of gun wielding gauchos, Italian family roots, nautical Christmas displays, historic battles, young lovers, old soldiers, tango missteps and travel with friends, the Petralias remind us that life’s most memorable moments often begin by taking a chance. What happens if you decide to make a dream come true? Newly retired and looking for more than a vacation, John and Nancy Petralia intrepidly pack a few suitcases and head to the "perfect" Italian city. Within days their dream becomes a nightmare. After residing in two Italian cities, negotiating the roads and healthcare, discovering art, friends, food, and customs, the Petralias learn more than they anticipate--about Italy, themselves, what it means to be American, and what's important in life. Part memoir, part commentary, quirky and sincere, Not in a Tuscan Villa is about having the courage to step out of your comfort zone and do something challenging in later life. The adventure recaptures the Petralias' youth, rekindles their romance--and changes their lives forever.